Except where otherwise noted, comparisons are to February 5, the last pre-Olympics Monday. NBC: The midseason premiere of THE VOICE was at 2.7, down 0.4 from midseason 2017, but up 0.1 from last fall. GOOD GIRLS had a solid start at 1.5, although that’s only up 0.1 from the September premiere of THE BRAVE, which didn’t get a back-up order. 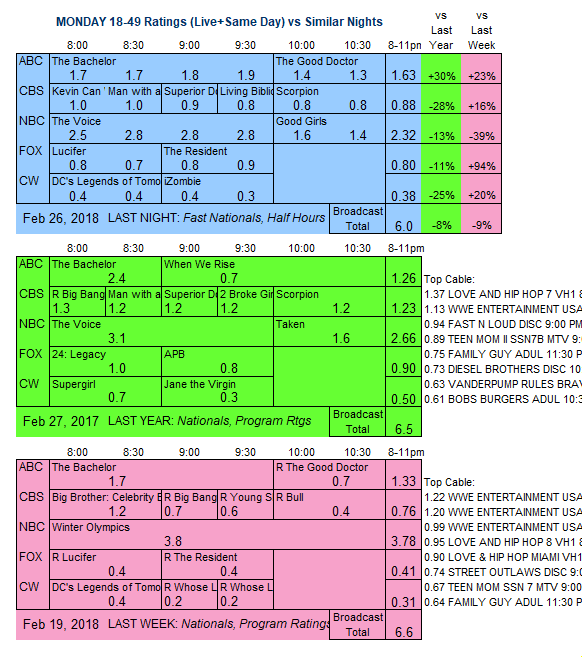 CBS: KEVIN CAN WAIT fell 0.2 to 1.0, MAN WITH A PLAN was down 0.1 to 1.0, and SUPERIOR DONUTS lost 0.1 to 0.9. LIVING BIBLICALLY debuted with an unpromising 0.8, down 0.1 from the last 9JKL. SCORPION returned at a steady 0.8. ABC: THE BACHELOR gained 0.1 to 1.8, but THE GOOD DOCTOR returned at 1.3, down a heavy 0.4 from its last new episode. 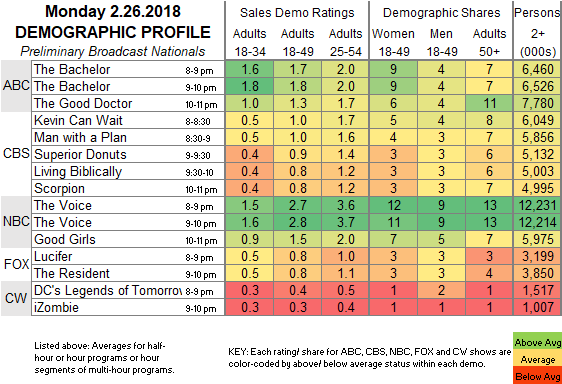 FOX: LUCIFER dropped 0.2 to 0.8, and THE RESIDENT fell 0.3 to 0.8. CW: LEGENDS OF TOMORROW held at 0.4, and the season premiere of IZOMBIE was at 0.3. The broadcasters go back to their pre-Olympics line-ups tonight. On cable, USA premieres its new series UNSOLVED.